The art and civilisation of the Byzantine empire which succeeded the Roman Empire to the East. Emperor Constantin chose Constantinople and not Rome as his new Capital and residence. 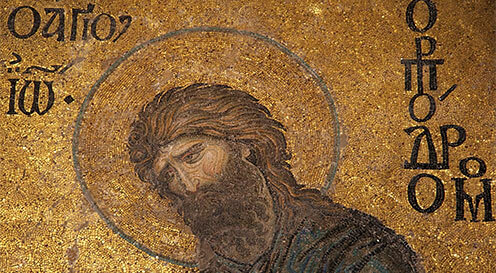 One of the influences on the Byzantine art was the iconoclastic controversy raging between 726-824 . Richly decorated floral and animal depictions gave way to more geometric (some would argue Islamic influenced art) for simple ornamentation. Subsequently, the figurative work of icon making became highly regulated by the church. Human forms were stylised and only certain events in Christianity were allowed. Even the exact placement of characters in religious scenes were prescribed in great detail. The Byzantine period is from 300AD to the mid 15th Century at its epicentre and several hundred years outside it. Byzantine art and architecture had a great influence and lived on in the Balkans mainly as a form of Christian Religious art. It is also the key influence behind Orthodox Christian art in Bulgaria, Ukraine and Russia. Churches were decorated with mosaics, frescos and stone carvings.